OGL Computer Services Group has been delivering technology solutions to organisations across the UK for over 40 years. Currently, we have around 1,200 customers using our products and services to drive their business forward. ERP software that brings together common business processes into one central system for incredible control, insights and opportunities. Unsurpassed expertise to handle any workplace IT requirement. We offer cutting edge, managed IT solutions through to simple IT support packages. The very best in IT security for businesses looking for premium IT performance in a protected, secure environment. As expected from a premier technology company, we’re accredited by many leading global brands such as HP, Microsoft, VMware, Veeam, WatchGuard and Kaspersky. Discover the satisfaction of working for a leading technology company. 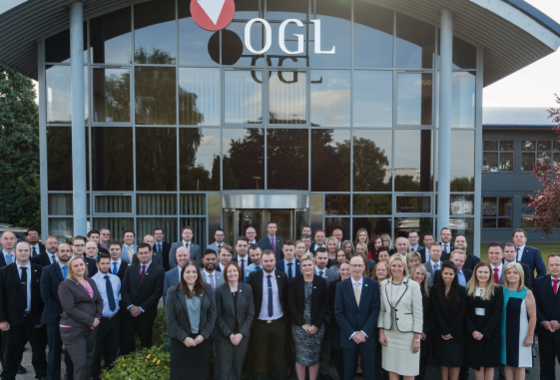 A role at OGL means you’ll be part of the exciting, ever-changing world of technology but will have the security of a business that has been around since 1976. We have excellent opportunities for technology-minded people but it’s not just IT roles we recruit for. Many skills and talents make up our 260-strong workforce. We’re a friendly but hardworking bunch here at OGL Computer, led by a board of directors and management team. The brilliant contributions of our employees are formally recognised at our annual staff awards events. Without our people, OGL wouldn’t be what it is today.